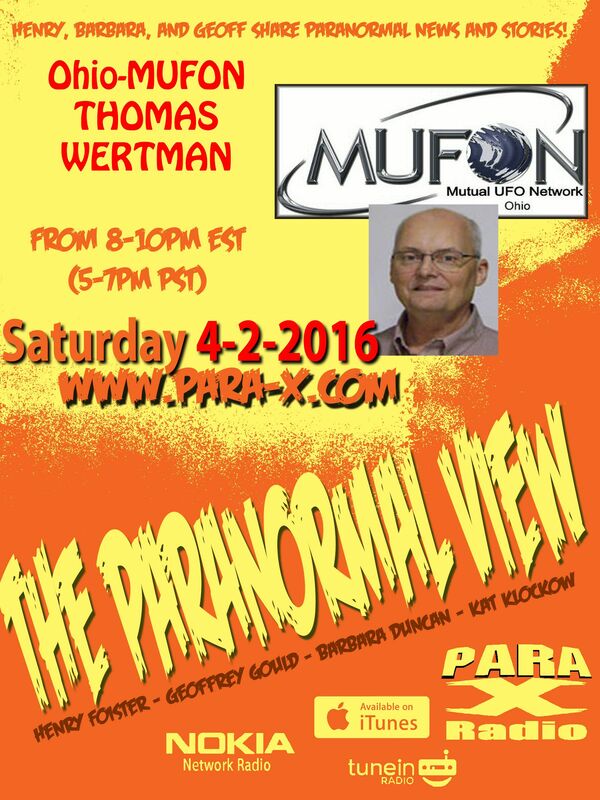 New Year's Eve from 206 into 2017; we ran an Encore Presentation of the 02 April 2016 edition, in which we welcomed back UFOlogist Thomas Wertman of MUFON. We joked about the weather being strange, thunder with snowstorms and sun-showers; I couldn't resist blaming HAARP. Henry asked about upcoming UFO conferences, following up about law enforement submitting reports. We revisited the story about which he spoke his previous show, with the clothing of abductees' having a pinkish tinge, and how Betty Hill's clothing had also had a similar pinkish hue on her new blue dress. Thomas stressed that some investigations' details are not released, so as not to contaminate witness testimony. We discussed how more people having more smartphones and social media "exploding" with so many sightings, but also how gummed up some such video postings can create. I pointed out the awesome Star War fan video of San Francisco with the Death Star and Star Destroyers hanging casually in the sky, without even the camera being locked down on a tripod. Thomas mentioned a similar video, with the Enterprise. We concurred our slight annoyance regarding the goofy Fact or Faked series on Siffee, where they would check out Internet videos, and if they were able to replicate it, they claimed it was "debunked," as opposed to the simple fact... they could replicate it, which is not Explaining it. Thomas spoke about a landing report in Mechanicsburg, Ohio. A farmer saw lights in the sky, and drove along until coming across a craft hover; he followed it until it'd flown out of sight. His car clock broke, and his at-home cable DVR hard drive had crashed. After the second break Ceiling Cat Barbara Duncan reported out having listeners tonight in the US, the UK, Australia, Tunisia, Canada, Pakistan, Singapore, and Unknown. Thomas discussed the tendency of cryptid (sometimes ghosts), sightings near UFO sightings. He spoke about Skinwalker Ranchm the millionaire Bob Bigalow of Bigalow Airospace, and UFO reports for a time went to his research department. Discussing disclosure, Thomas brought up current "presidential" "candidates" and John Podesta working towards public disclosure, that clearly is being shot down. Thomas and I discussed how Travis Walton's personal experience in his Fire in the Sky book, being completely screwed up in its cinematic "version." Apparently the book and its story is being remade, and properly. Thomas spoke of some of his early years' UFO experience/s. He and a friend of his, while out hunting, spoke about what seemed to describe a Sasquatch, as well as seeing White Owls. As they became more agitated, Thomas saw a craft above the treetops. As the last couple of minutes arrived, Skype kicked me off the call, rendering me unable to provide the official Paranormal View page page, my Paranormal View hub page on my website, indicating people from there can find the show's respective report pages, that we're very findable on Facebook, or giving out absent Kat's own katklockow.com website, her Twitter, and jinxed comic site and jinxed comic Twitter profile. 02 April 2016 The Paranormal View.